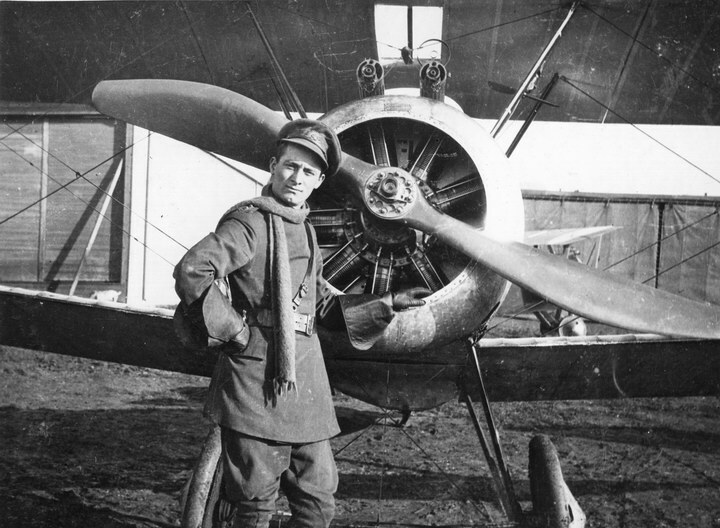 Alex had transferred to Flying school in England and graduated as a flying officer and was appointed 2nd Lieut and posted to the Australian Flying Corp. Now wearing wings he proceeded overseas to France and reported for duty with the No 4 Squadron AFC, the last squadron to be formed during the first World War. 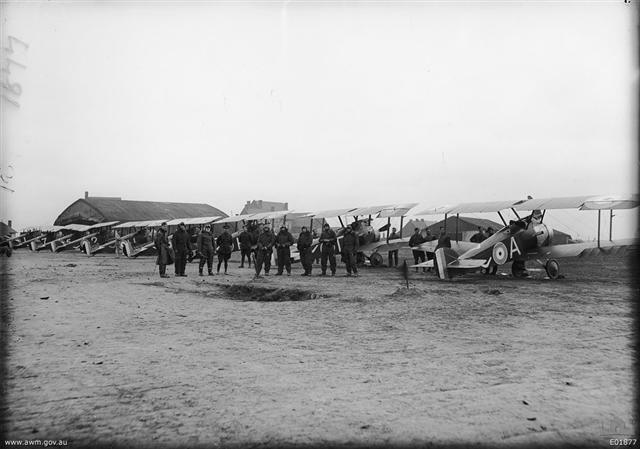 March 1918 saw an increase in the 4th squadron’s ground attacks and offensive patrols, including a notable engagement with elements of Manfred von Richthofen’s “Flying Circus” on 21 March, during which five enemy machines were downed in an attack led by Captain Arthur Henry Cobby , who would become the AFC’s number one flying ace . No. 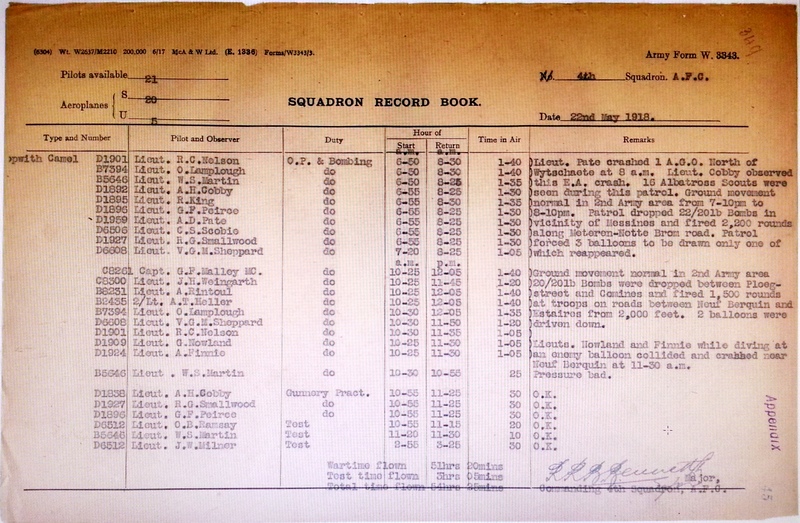 4 Squadron claimed more “kills” than any other AFC unit, 199 enemy aircraft destroyed and 33 enemy balloons were destroyed or driven down. Alexander Finnie’s name is located at panel 188 in the Commemorative Area at the Australian War Memorial (as indicated by the poppy on the plan). 1. AWM P07219.001 Description attached to the Studio Portrait of Alex Finnie. Studio portrait of Second Lieutenant (2 Lt) (later Lieutenant) Alexander Finnie, 4th Squadron, Australian Flying Corps (AFC), of Botany NSW. A sheet metal worker before enlisting on 21 August 1914, he embarked from Sydney as a Sapper with the 1 Field Company Engineers on HMAT Afric on 18 October 1914. 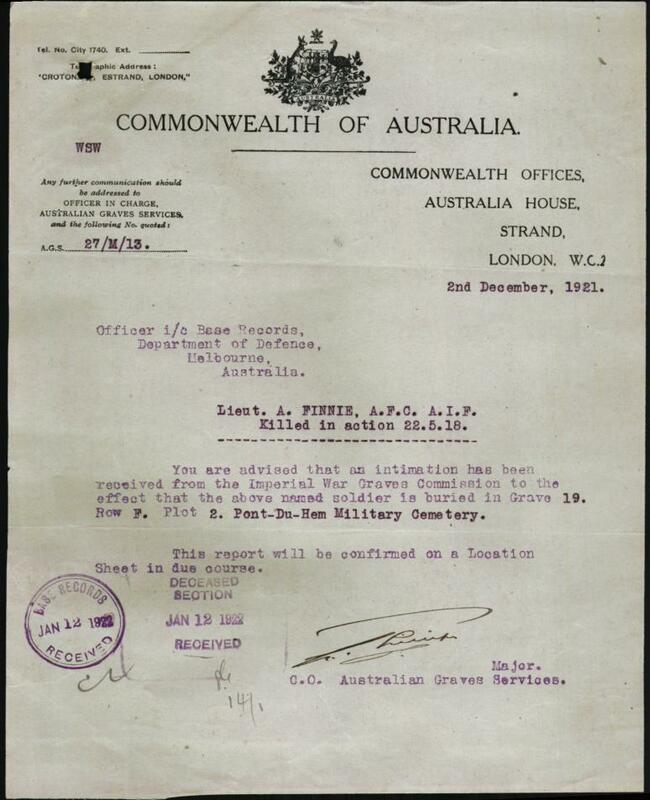 He was evacuated from Gallipoli with gas poisoning on 18 August 1915. 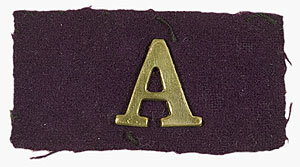 He was promoted to Lance Corporal on 22 January 1916, to Second Corporal on 9 March 1916, and to Temporary Corporal on 23 July 1916, this rank becoming permanent on 9 August 1916. 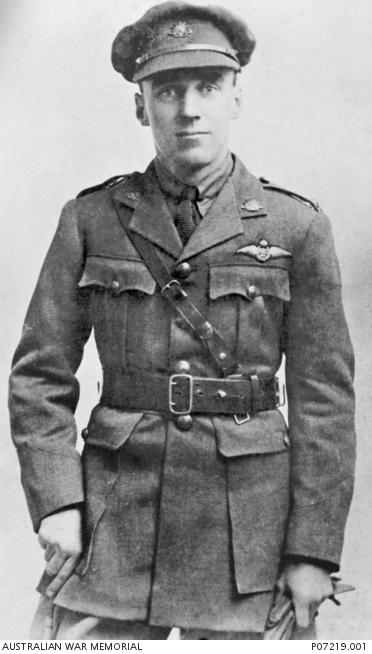 On 30 April 1917 he transferred to the AFC, and having graduated as a pilot was promoted to Second Lieutenant on 6 November 1917, then to Lieutenant on 6 February 1918. He was killed in action near Estaires on 22 May 1918, when his plane collided with another 4th Squadron plane while shooting down balloons behind the German lines. He was 25 years old. 2. Lieut.G Nowland. was a tent maker, from Clifton Hill and North Fitzroy Melbourne. B. 23rd March 1892. 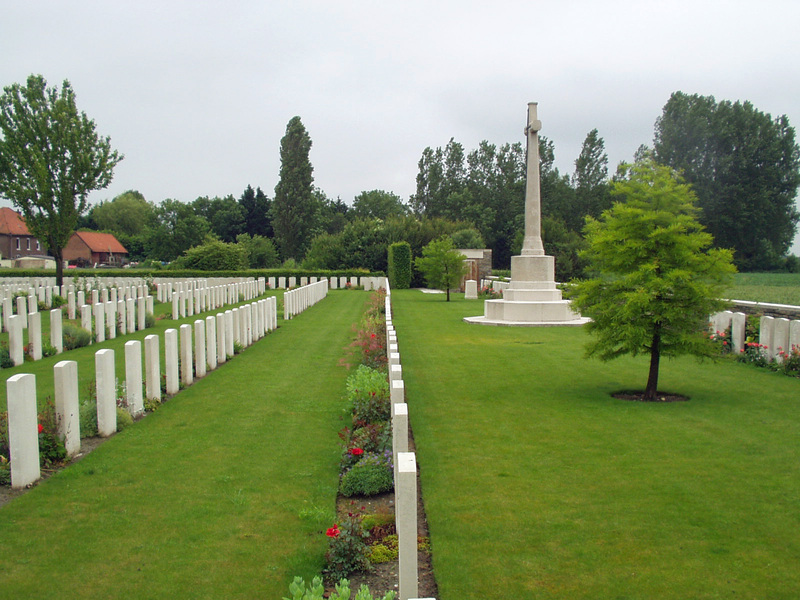 EDIE only daughter of ALEX & IDA FINNIE who died 21st Dec 1911 aged 19 years; also ALEX their dearly loved elsest son, Flight Lieut 4th Squadron AFC, killed in action 22nd May 1918, buried in Pont Du Hem Military Cemetery, Lagorgue France. 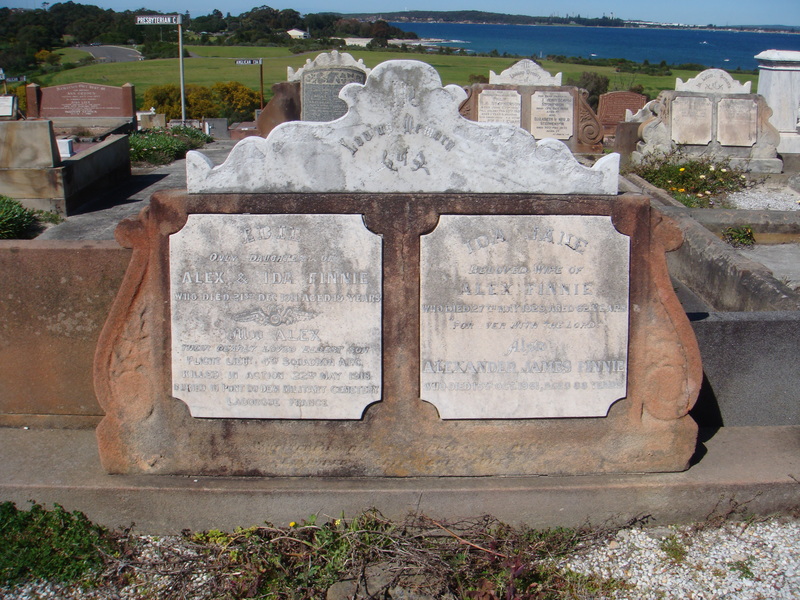 IDA JANE beloved wife of ALEX FINNIE who died 27th May 1929 aged 62 years; also ALEXANDER JAMES FINNIE who died 15th Oct aged 88 years. 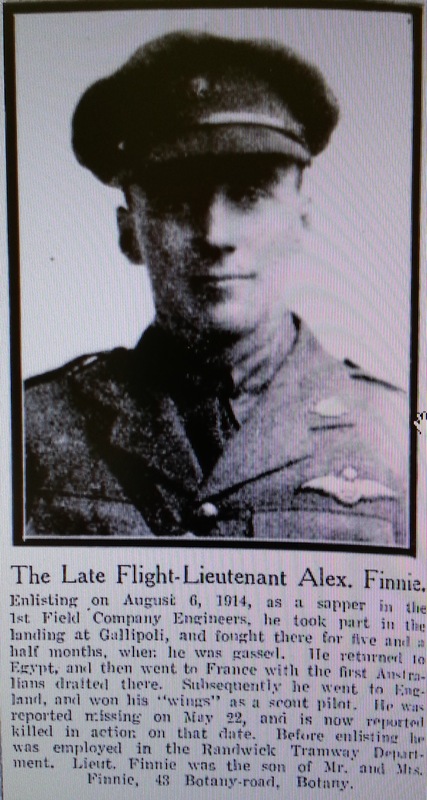 Alexander Finnie was also remembered and honoured on this 100 year Anniversary with his image included with 26 portraits projected onto the Pylons of the Sydney Harbour Bridge. The following is the link to the website.